How do you move on from an irreplaceable loss? In a poignant debut, a sixteen-year-old boy must learn to swim against an undercurrent of grief—or be swept away by it. Otis and Meg were inseparable until her family abruptly moved away after the terrible accident that left Otis’s little brother dead and both of their families changed forever. Since then, it’s been three years of radio silence, during which time Otis has become the unlikely protégé of eighteen-year-old Dara—part drill sergeant, part friend—who’s hell-bent on transforming Otis into the Olympic swimmer she can no longer be. But when Otis learns that Meg is coming back to town, he must face some difficult truths about the girl he’s never forgotten and the brother he’s never stopped grieving. As it becomes achingly clear that he and Meg are not the same people they were, Otis must decide what to hold on to and what to leave behind. I was lucky enough to come by a signed copy of Phantom Limbs at the Texas Teen Book Festival in Austin soon after it debuted. Of course, with my crazy busy school schedule, I didn't get a chance to read it until Thanksgiving break. However, as soon as I picked Garner's standalone novel, I was hooked. I devoured the entire thing in less than two days and enjoyed every minute of her witty yet heartfelt writing. Come meet, Otis, a boy drowning in his swim schedule, raging hormones, grief for his brother, and a sense of loss love for his childhood sweetheart. Despite his relatively young age, his love of classic literature and wise sense of the world and relationships gives him an old soul. I immediately liked him, and my love for his character continued to grow as he endured hardship after hardship. The other characters are equally well-developed, from Meg (his charismatic and endearing old friend) to Dara (a hardened survivor of a terrible accident, as well as Otis' demanding swim coach). Even Otis' parents get a decent amount of attention, which pleased me. It's not often you see a young adult book that tackles family relations as well as this one does. Otis' tale is one of sorrow and grief, as well as healing. After losing his toddler brother, Mason, almost three years ago, his life has been flipped upside down. Garner deals with loss in a poignant yet realistic way. I appreciated that she didn't seem to be trying to write a tear-jerker. Instead, she was attempting to accurately portray the manner in which death can affect everyone it touches. It's stain can't just be wiped away, and the road to recovery isn't an easy one. Her humorous writing, as well as her strong understanding of her characters and her relationship, made the tale both enjoyable and heart-wrenching. Although the story was slightly predictable, I still flipped every page as quickly as I could in hopes of confirming my suspicions. My personal favorite aspect of the tale was Garner's depiction of Otis' love for Meg. Yes, he's a teenage boy who is often prey to his sexual fantasies, but underneath that lies a sense of pure adoration. Their relationship with each other runs deep, like a spring that has existed for ages. I was rooting for the two of them the whole time, even if their relationship wasn't perfect. Kudos to Garner for creating such a believable and heartfelt relationship. 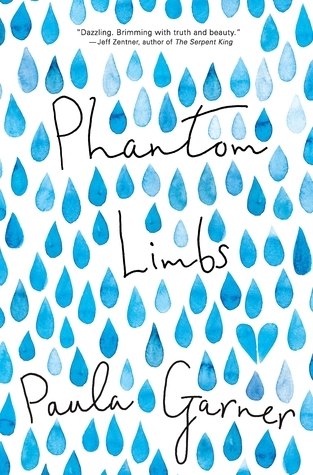 If you haven't had a chance to check out this 2016 debut, then you're in luck: the holidays are coming up, and maybe you'll finally have the time to curl up with Phantom Limbs. It's a unique young adult story that will engage your heart while bringing a smile to your face. It's sweet, it's sad, and it's beautiful.